Back-to-school shopping ranks right up there with Christmas as a major budget buster for families. This year, parents with children in grades K-12 are expected to spend an average of $501 on everything from clothing and paper to pencils and crayons, according to Deloitte’s Back-to-School Survey. Here are some strategic ways for budget-conscious parents to keep back-to-school spending from spiraling out of control. I actually begin my back-to-school prep when the kids bring home all of their stuff at the end of the year. I go through the folders, pencils, markers and more and figure out what’s still good. I then put all of it in a big plastic bin and wait for the school supply lists to arrive. This year, the bin held enough pencils, pens and markers from last year to outfit both my kids for the new school year. Both their pencil boxes survived, along with their scissors and rulers. Once we were done with the bin, I checked to see what else I may have already had around the house. For example, my son needed a binder and I had a few left from various committees I’ve served on through the years. I recycled the papers inside (which I probably should have done years ago) and he soon had a binder for language arts. Between shopping around the house and using leftover supplies, I was able to knock off nearly half the list. The same goes for clothes and shoes — anything that still fits is one less item we need to buy. Remember the binders I mentioned above? If you don’t have any at home, check out the nearest rummage sale or thrift store. Neither is a sure thing, but if the store has a binder or two — or other supplies on your list — there’s likely a steep discount. If you don’t mind gently-used clothing, these are also great places to look for kids’ clothes — especially since they often outgrow them so quickly. 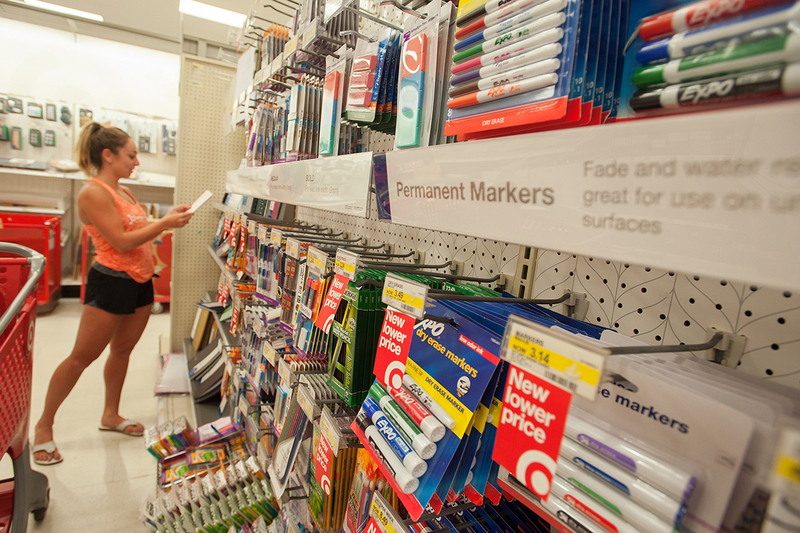 Each of these types of stores offer items you’ll need — and since the stores aren’t everyone’s first thought for school supplies, you might be able to find better deals. To save cash on facial tissues and cleaning supplies, stop by your local dollar store. If you have several children and need to buy more boxes of facial tissues — this year I needed to buy six for my two children — a trip to Sam’s Club or Costco may be a better choice. Do a little math to figure out where you can find the best deal per box or roll. For pencils, pens and paper, try an office supply store like OfficeMax — the prices are often just as good, if not better, than the big discount chains. Even better, sign up for the store’s rewards program and you’ll earn points to use toward future purchases. Don’t be afraid to look online to maximize your savings. Target recently ran a promotion on online orders that you picked up at the store. I went online and picked out my kids’ gym shoes, then picked them up in the store — saving $10. If you do go the online route, check out Ebates.com first. Select the store you’re looking for and you can earn rebates on the amount you spend. A bonus: Ebates often has additional coupons and codes for free shipping right on the retailer’s page so you can also take advantage of even more savings. While picking out folders at Target, I found plain ones for 48 cents — the one with the cute cats was $1.50. My daughter asked for the one with the cats and I said she could get it — if she used her own money. She declined. Generic school supplies can save you lots of cash. If your children complain about having plain notebooks and folders, suggest they decorate them with their own drawings, stickers or other options. The same goes for all the paper and cleaning supplies on your school-supply list: Going generic is perfectly acceptable. Who cares if the tissue box is plain blue or has the characters from “Frozen” on it? Retailers and companies each have coupons for different items on the school supply list, and often you can combine them for extra savings. For example, I received a flyer from Target that included coupons for pens, markers and more. I cut those out and combined them with an in-store mobile coupon offering $5 off when you spend $25 or more on school supplies. This saved me $15 on $50 of supplies on that shopping trip. One smart friend divided her kids’ school supplies into four separate carts of just over $25, then used the mobile coupon four times — instead of just saving $5, she saved $20. Also if shopping at Target, be sure to check out the Cartwheel app — its offers often mirror printed coupons, and you can use both at once. Don’t be afraid to double up. As my kids have grown older, shopping for school supplies and clothing isn’t as fun as it used to be (who really wants to pick out a protractor?) — and more expensive. With some of the tips I’ve outlined above, I hope you’ll find a few ways to save and cut down on the back-to-school shopping bill. Your Turn: How do you stick to your back-to-school shopping budget?